There was a cheer from the fans in attendance at Radio City but it could have been louder. It could have been more enthusiastic. Mack was a tremendous pick at five but there were parts of Raiders Nation that wanted a quarterback. The Jacksonville Jaguars at three had selected Blake Bortles, leaving Heisman Trophy winner Johnny Manziel still on the board. The Dallas Cowboys were rumoured to have wanted Manziel and the Raiders had the chance to take him. Instead, they beefed up the backfield and left drafting a QB to the second round or later. Manziel was selected by the Cleveland Browns at 22 and the Minnesota Vikings picked up Teddy Bridgewater with the final pick of the first round. It was at the top of the second round that the Raiders addressed their QB need with Derek Carr from Fresno State and little did people know, it would change the future of the franchise. The Raiders’ 2014 draft was the perfect example of how to rebuild your franchise with smart picks in the top few rounds in order to make your side competitive again. Defensive tackle Justin Ellis was taken at the top of the fourth and finished the season in the pro bowl. Despite losing their opening 11 games, there was promise. 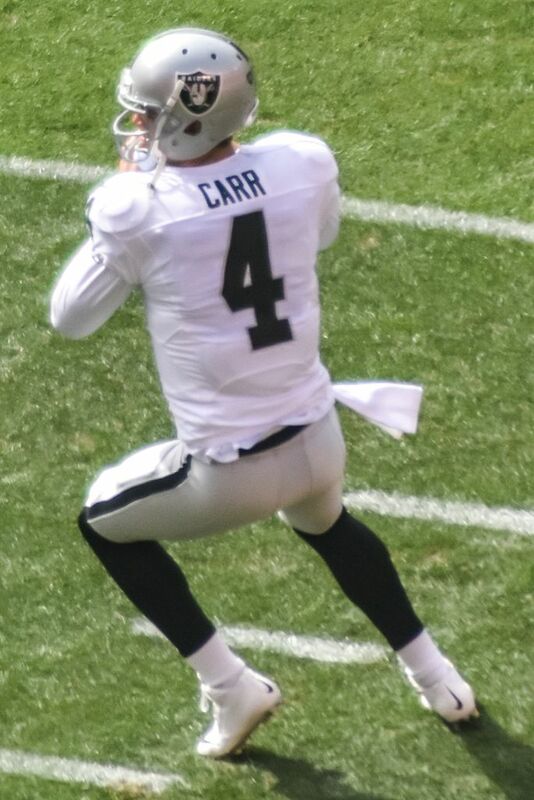 Carr was establishing himself an excellent signal caller, one that could become the face of the franchise given time. Mack was making plays in the backfield and getting sacks, quickly becoming one of the most exciting prospects in the league. Head coach Dennis Allen lost his job after week five and the team went on to finish 3-13 but it wasn’t all doom and gloom. The fans had realised they had struck gold with Mack and Carr and the 2015 draft would allow them to add pieces to a very promising team. With the fourth pick of the following draft, the Raiders selected Amari Cooper, the best wide receiver in his class. All of a sudden, Carr had a genuine number one receiver and a threat in the end zone. Defensive end Mario Edwards Jnr was taken in the second and again, there was excitement for the season. Jack Del Rio was placed in charge and with Carr in his second season, there was talk of being in play-off contention. That talk ended in week 15 but it was miles better than the previous season, where they were eliminated in week 11 – making them the earliest team since the 2004 Dolphins to be eliminated from postseason contention. The season finished 7-9 and the Raiders were no longer a laughing stock. Mack and Carr ended up in the pro-bowl and all of a sudden, Raider Nation had players they could be proud of. On April 29th, they will have the 14th pick of the draft and after using the previous two drafts to fill glaring holes in the squad, they can now pick best player available to really cement their status as a play-off contender. It just goes to show how drafting correctly can really turn a franchise around.